A quintessential Gainsborough melodrama following the marriages of three sisters, whose husbands, it turns out, range from the tolerant to the tyrannical. The sisters are played by three splendid actresses whose looks (and diction) epitomise a long-gone era: Phyllis Calvert, Dulcie Gray and Anne Crawford. 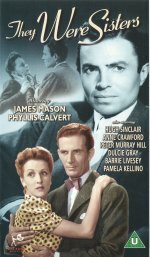 Today, though, the main interest is in the character of Geoffrey, a no-good sadist who causes untold misery to Gray's sweet Charlotte: he's played by a young James Mason, giving a performance every bit as vicious as his work in The Seventh Veil and The Man in Grey.